You want a show with a fairly ridiculous premise, extremely unlikely plotlines but that has fabulous characters that you quickly love and that you become totally addicted to? This may possibly be the show for you. Chuck (Zachary Levi) is a college dropout living with his sister Ellie (Sarah Lancaster) and her boyfriend Awesome (that is his nickname, because he is so awesome) (played by Ryan McPartlin). He works with his best mate, Morgan (Joshua Grimes) and a selection of dropkicks Lester (Vik Sahay), Jeff (Scott Krinsky) and Big Mike (Mark Christopher Lawrence) at an electrical supply and technical assistance store. That is until an old schoolmate sends him an email with a file attached and he ends up downloading the entire supercomputer of the CIA into his brain. Chuck has become an asset and must be protected – in step his two handlers, Sarah (Yvonne Strahovski) and John (my favourite, Adam Baldwin). And things get ever more ridiculous, implausible and wonderful. The show ran for five seasons, finishing in 2011. I’ve not yet seen the last series, but have really loved everything so far. Of course, I don’t believe the decisions they make and the way the handle each other, but if it were real, it would be a callous and possibly unwatchable event. Or it may have been an all-different kind of awesome. But I really like this awesome, personally. Mysterious spaceships appear over many major cities across the USA and, indeed, across the world. No-one is sure if they are friendly or not – no-one, that is, apart from David Levinson (Jeff Goldblum) who needs to get himself in front of handsome President Thomas J Whitmore (Bill Pullman, and for more on the hotness of Bill Pullman, click here) and convince him of this. Meantime, drunk Vietnam veteran and ex-alien abductee Russell Casse (Randy Quaid) continues to embarrass and annoy his family. Until the aliens attack, killing many and destroying whole cities. Few survive, but they include First Lady Marilyn Whitmore (Mary McDonnell) who is left injured amongst smouldering wreckage and stripper Jasmine Dubrow (Vivica A Fox) and her small son (and dog. Of course, the dog couldn’t die). Why do we care about the stripper? Because she’s got a hot boyfriend – Captain Steven Hiller (Will Smith) who is not only hot, but becomes one of the heroes as the world (well, let’s face it, the USA on behalf of the world) tries to find a way to battle these aliens. I love Independence Day so much. I love that it is a simple story with a million flaws, but there are a whole heap of explosions and a lot of humour. It is far from a perfect film, but I’ll watch it again and again and again. Without a doubt. 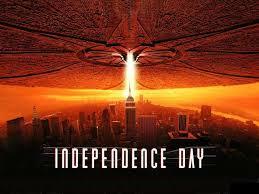 Independence Day won an Oscar for Best Effects, Visual Effects and was nominated for Best Sound. From the opening shot with the actors playing the Marine recruits having their heads roughly shaved at the start of the training, Kubrick captures the life in US service during the Vietnam War. It follows the recruits being relentlessly tormented by Gny. Sgt, Hartman (R. Lee Ermer) through their training then following them to Vietnam; to the impatience of life on base to the horrors of life in the field. There really can be no denying that Kubrick was a master filmmaker. I wonder if a film now could be made with the long, drawn out establishing shots like this. Kubrick captures so many stages of life as a Marine. The destruction of the spirit of less capable recruits like Private Leonard (Vincent D’Onofrio); the anger and bloodlust of some in the field like Animal Mother (Adam Baldwin); the speculation and curiosity of the observer journalist/soldier like Joker (Matthew Modine). It’s a beautiful and horrible yet magnificent film. 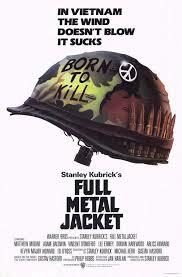 Full Metal Jacket was nominated for an Oscar for Best Writing, Screenplay Based on Material from Another Medium.